I’ve worked on a variety of shows with the Idiots, including Get Happy for kids, The Ghost Train, which featured an orchestra of lawnmowers and other random props, Every last Trick, a collaboration with Spymonkey and the Simon Armitage penned musical, I am Thomas. Napoleon is my first time devising with Kathryn directing and Paul onstage, which is very exciting. I hope the sound will be important to the piece, as I am creating the soundtrack alongside the rest of the material. Kathryn and I had several meetings about the music before we started rehearsing, looking at what sort of sounds/music might give us Napoleon’s emotional world. An obvious starting point was trumpet music. We also listened to lots of contemporary sax music and on a different note, silent film music. We used a couple of Chaplin films as reference for the use of music. In the early stages I’m mostly trying to find a sound/music palette which work for the style of worlds we inhabit. 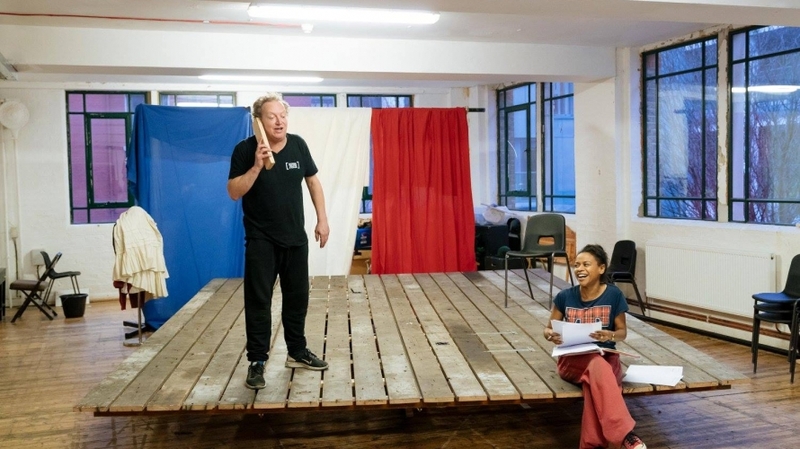 The rehearsal room has been a very collaborative space with a relaxed atmosphere, allowing everyone to contribute in their own ways. It’s still intense though! For me it was interesting to witness a fairly complicated, heady discussion about the Waterloo scene be eventually transformed into a really creative method of telling that story. Finding the music for Paul’s own funeral improvisation (yep! ), was morbid fun…Since I know something of Paul’s music tastes, picking opposite style of music was much more amusing. Not sure I won that battle though, we’ll have to wait and see what makes the cut. Another improv came with Kathryn’s provocation, “Napoleon’s body parts”. This resulted in an anarchic sequence involving a Hollywood producer, 3 crazy films, and a lot of bizarre sound effects and music. Highly entertaining!